In 1193, the Shogun Minamoto no Yoritomo, who established the Kamakura Shogunate the previous year, hosted a makigari hunting (a style of hunting where warriors shoot arrows at a prey after a large number of people chase the prey towards the warriors) at the foot of Mount Fuji. Brothers Soga no Jūrō Sukenari and Soga no Gorō Tokimune decide to take part in the hunting event and learn that the murderer of their father, Kudō Suketsune, will also participate in it. They make up their mind to kill him for revenge. Before departing for the hunting event, the brothers visit their mother, living in the village of Soga. The purpose of their visit is to ask her pardon for their younger brother Tokimune, who disobeyed his mother’s order of becoming a Buddhist priest and was repudiated. They also want to bid farewell to their mother before leaving for the hunting event, where they will act in revenge. Although the mother welcomes her older son Sukenari, she pronounces again that she disowns Tokimune. She announces that if Sukenari tries to mediate on behalf of his brother, she will disown both of the brothers. Sukenari therefore steps out with Tokimune in front of the mother, explains the plan of revenge, and begs her to forgive his younger brother. The mother, however, persists in saying she cannot forgive Tokimune. Their mother’s stubbornness discourages the brothers in trying to persuade her, and they almost leave the house in tears. Mother, who cannot hold her emotions any longer, stops them and pardons Tokimune. The three shed tears of joy at the reconciliation. Centering around Sukenari who is deeply moved, the brothers dance for lingering farewell after exchanging a cup of sake for departure. Then, they bid their mother farewell in tears and bravely leave in order to accomplish their revenge. 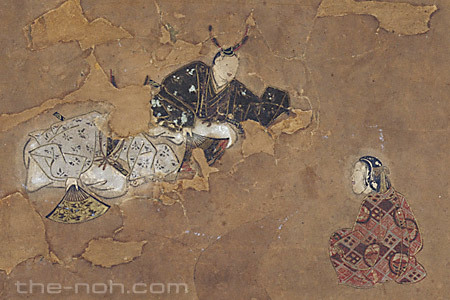 This piece is one of the ‘Soga-mono’ (stories of the Soga), so-called for being a play whose story is about the “Soga” brothers. 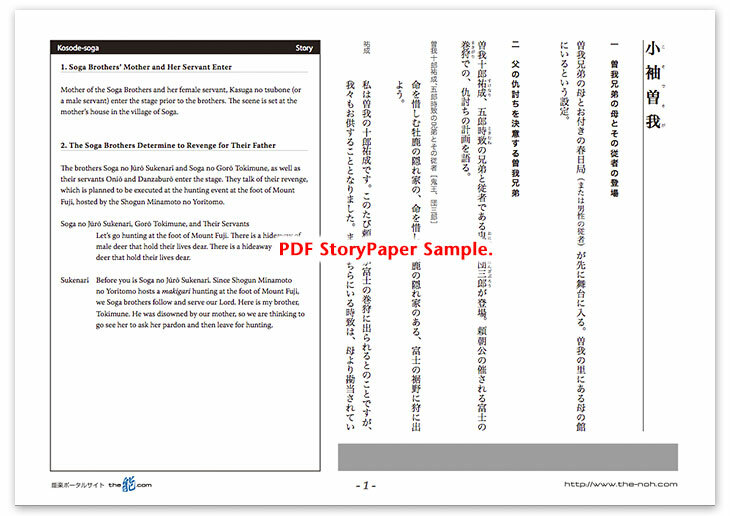 Each story of the Soga-mono describes the revenge executed by the Soga Brothers from different aspects. The Japanese people have been familiar with the episodes of the brothers since they became the subject of not only Noh dramas, but also of other forms of performance art. Kosode-soga sheds light on the episode where the Soga Brothers, determined to execute revenge, visit their mother to reverse her feelings of disownment towards her youngest son and bid her farewell. This piece describes the movement of tender feelings between the mother, Sukenari, and Tokimune through the events that the mother at first does not forgive Tokimune, to finally reversing her vow of disownment, and to offering cups of sake as a farewell to her sons. Although the object of the trip is a bloody revenge, the story focuses on human empathy, which is unchanged through the ages. This drama therefore successfully keeps a gallant atmosphere and remains popular through the ages. Unlike many other Noh dramas, which emphasize subtleness and profoundness, the simple visual effect is one of the highlights of this piece, including the staging that the brothers show their sadness in the same form and gallantly dance together. Furthermore, there is no waki (supporting cast) in this piece. It also makes this piece unique.